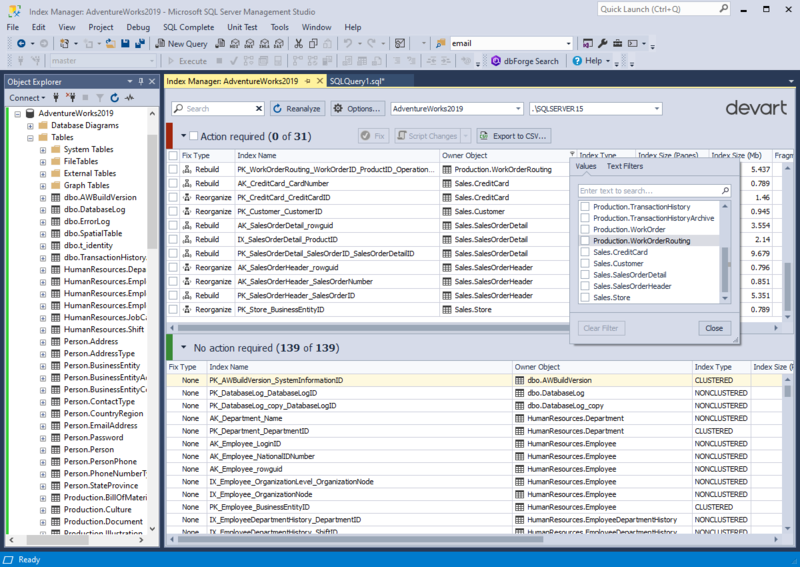 dbForge Index Manager is a handy SSMS add-in for analyzing the status of SQL indexes and fixing issues with index fragmentation. The tool allows you to quickly collect index fragmentation statistics and detect databases that require maintenance. You can instantly rebuild and reorganize SQL indexes in visual mode or generate SQL script for the future use. dbForge Index Manager for SQL Server will significantly boost SQL Server performance without much effort! The tool allows you to get an overall picture of a database as well as its specific objects for better fine-tuning. Flexible choice of connections and databases allows to easily switch between analyzed objects. Among other advantages are a combo box with user connections and auto-refresh upon switching between databases. The scan results can be saved to output file in the CSV format for further index fragmentation analysis or for the sake of reporting. You can generate reports on the state of indexes in your database using the CSV export. 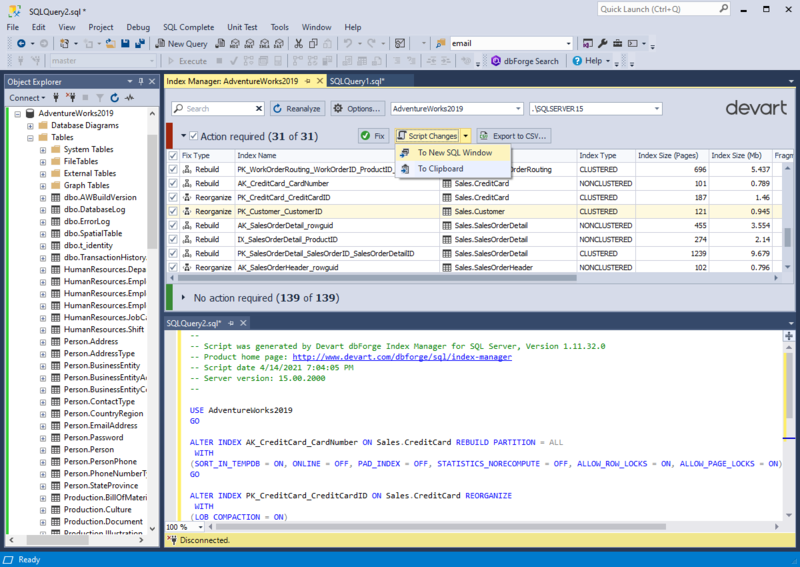 With dbForge Index Manager, you can generate T-SQL scripts to execute index rebuild and index reorganization commands. Use Script Changes to save a script for the set of indexes that are often fragmented (require frequent rebuild or reorganization). The tool includes the command-line interface allowing you to automate your routine index management tasks. How Can dbForge Index Manager Help DBAs and Developers? Gives a thorough insight into the status of SQL indexes within your databases. 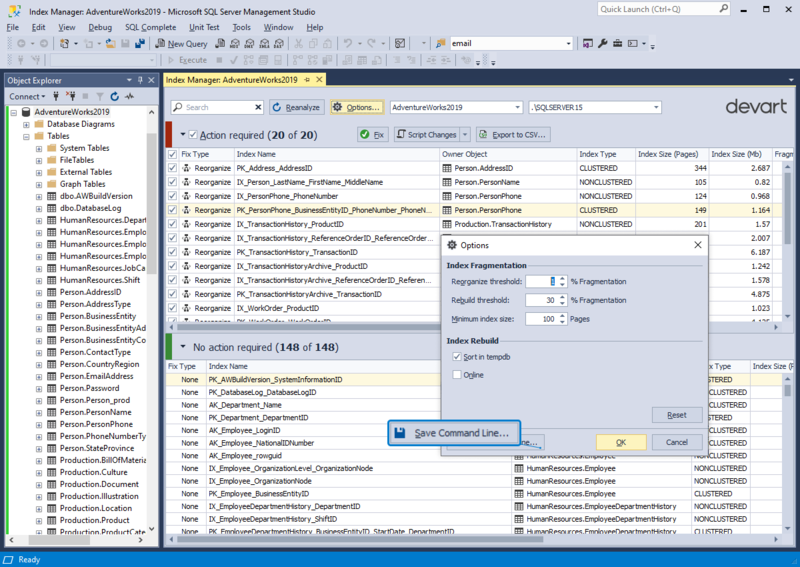 Helps making a right decision on managing index fragmentation in SQL Server. Enables fine-tuning of index fragmentation and setting up scan results thresholds. Displays comprehensive index-related statistics to detect databases that require maintenance. 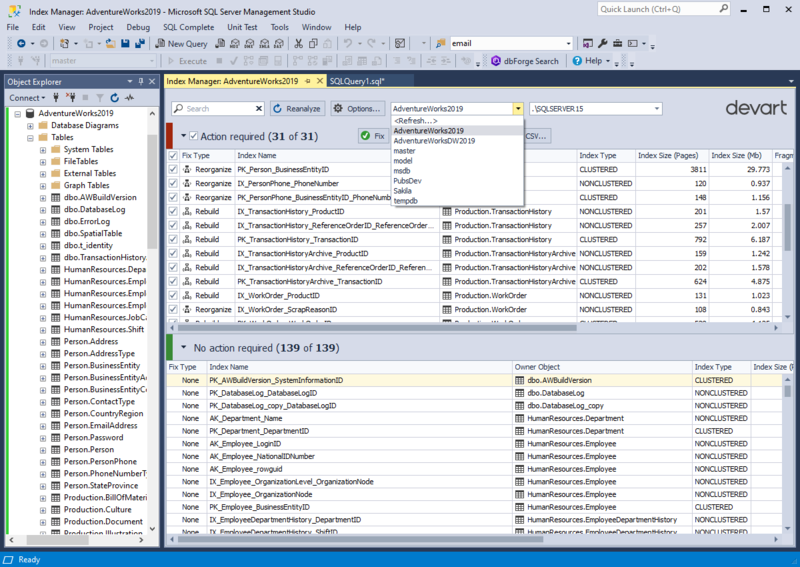 Allows generating T-SQL scripts to rebuild and reorganize indexes that are frequently managed. Enables the export of scan results to analyze or report on index fragmentation. 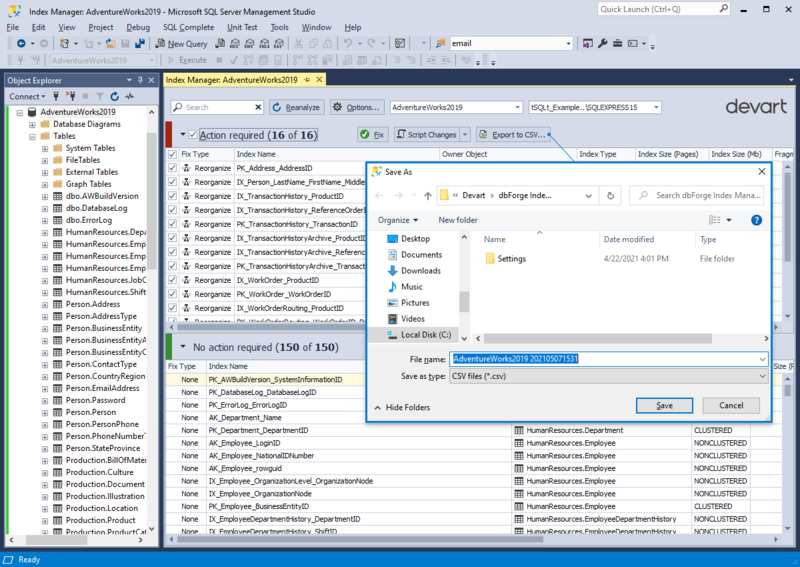 Index Manager is a part of dbForge Developer Bundle for SQL Server - an ultimate kit of fourteen database development and management tools for SSMS. Purchasing the single kit will save you 50% of the cost of each tool as compared to purchasing them individually. You can get a significant discount, and even a free license, by spreading a word about Index Manager. 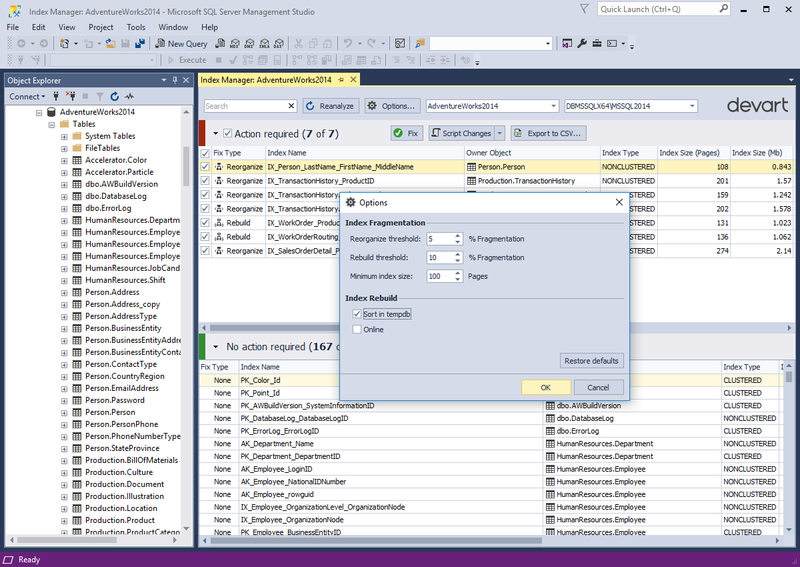 An SSMS add-in for populating SQL databases with external source data and migrating data between systems, supporting 10+ widely used data formats.